They didn't have to do it. I mean, it wasn't that big of a deal. Well, maybe it was. At the time. I gripped that steaming hot, tall, black coffee. Sniffed the heady aroma. Barred myself from even a sip. No spilling in the car or down the front of my Sunday outfit. Or scalding myself. Savored the anticipation. Picked it up on the way home from church. Well, after eating and running a couple errands. Planned to curl up with it and a good book. Our local Biggby Coffee. I love it there. I love the folks who work there. So cheerful. So helpful. I'm usually on the run. But I could sit in there. Relax. With a book or my 'puter. I'd feel so . . . so . . . writerly. I think I could even work there. And B-Happy. Come to think of it, I don't think I've ever met a Biggby I didn't like. But I digress. Hurry, Dennis, hurry! Go faster! Must go faster! Getting out of car. Juggling stuff. My purse. The coffee. Something else. I reached to hit the garage door closer thingie. And the cup. Went. Splat! Upside down. Top and bottom separated. Rose Dog's toys now suspended in frozen java. I posted my sorry state on Twitter and Facebook. I just wanted a little sympathy and compassion for my distress. And BiggbyBob replied. He wasn't even my friend. Then. "So sorry. What can we do?" "Do you deliver?" I responded. And then I got another message. Bigg-hearted Biggby wants to replace my coffee. Not once. But double for my trouble. And it wasn't even their fault! They didn't have to do it. Some might say it's a great marketing thing. But I choose to believe they care. A gift I'll pass it on. What random act of kindness have you done or experienced lately? Sandy - thanks for being a customer of ours! It means a great deal to us! Let me depart from my normal cranky persona to thank a former tuba playing Biggby barista in the Detroit area, who brightens my day and gives me a jolt of positive energy every time I see her. You could just make great coffee and be friendly and everyone would be good with it but you go well beyond that. 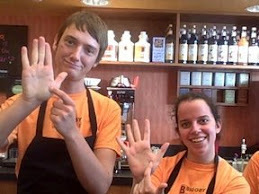 Merry Christmas to you, Ms. Barista and all the other great folks at Biggby Coffee. B Happy! 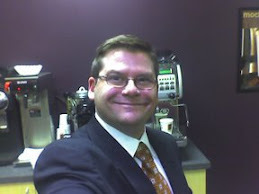 It is the BIGGBY way! Kindness is contagious, pass it on.